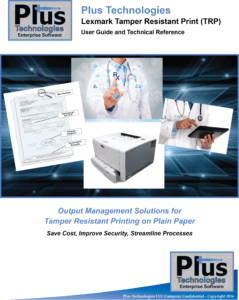 Plus Technologies has a new user guide available for Rx printing on Lexmark devices. All in all, this user guide is a technical reference for plain paper Rx printing on Lexmark devices. 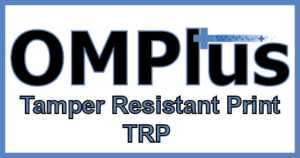 Moreover, OM Plus TRP is used for secure plain paper Rx printing. As has been noted, this user guide is now available, and if you are interested in seeing it please let us know. Plus Technologies’ OM Plus TRP provides an alternative to expensive pre-printed forms by providing tamper resistant printing on plain paper. Furthermore, OM Plus TRP can take data streams directly from ERP/EMR systems, parse the necessary data, merge it with tamper resistant technology, and deliver it to popular laser printers stocked with plain paper. Plus Technologies TRP utilizes anti-copy void pantograph technologies, microprint, and other authentication technologies. Also, documents created by OM Plus TRP protect our customers from unauthorized photocopying and scanning. Additionally, simplified calibration is possible through an easy to use UI. A popular use of our tamper resistant printing technology is the area of plain paper Rx printing. Specifically with OM Plus TRP healthcare organizations are able to create fully compliant, tamper resistant prescriptions on plain paper printers without the need or expense of prescription pads, expensive printer trays, or expensive forms. This plain paper Rx solution can take input from most popular EMR systems, parse the necessary data, create the tamper resistant prescription, and securely deliver it to a laser printer with plain paper. This tamper resistant prescription will include pantographic and microprint technologies so that any unauthorized copying or scanning is impossible. Generally, this process is approved in most states and can provide significant savings based on elimination of pre-printed forms, lower cost printer hardware, and simplified processes.